BACK PEDAL: DAN ROUNDFIELD, R.I.P. The basketball world lost a good guy. Former Central Michigan University power forward Dan Roundfield has passed away. Roundfield drowned trying to save his wife while the family vacationed in Aruba. He was 59. Michael Cunningham of the AJC with the horrible news. Roundfield played for the Chips from 1971 to 1975. In 1975, the Detroit native was named MVP of the MAC. Roundfield was drafted by the Indiana Pacers of the ABA in 1975 where he played for the Pacers for three seasons. Roundfield then signed as a free-agent with the Atlanta Hawks where his career took off. The power forward spent six seasons in the ATL. I first recall seeing Roundfield play for the Atlanta Hawks at Madison Square Garden. The Hawks had an interesting and fun team. Coached by Hubie Brown and Mike Fratello they had guys like Doc Rivers, Tree Rollins and Dominique Wilkins. Roundfield was a tough inside player with some hops. In a game that I watched live at MSG he had a couple of hard dunks. Roundfield could post you up, run the floor and shoot the mid-range jump-shot. Roundfield could defend very well and he was one of the better rebounders in the league. Roundfield was always a guy who was crashing the offensive glass when a teammate missed a shot. To me Roundfield was very underrated during his time with the Hawks. Roundfield brought his hardhat and lunch pail every night; a typical blue-collar guy from the city of Detroit. Roundfield might not have been the most talented player with the Hawks but he was the backbone of the that team. Here’s an outstanding article from back in 1980 on Roundfield via Sports Illustrated. People weren’t always trying to get Roundfield to play basketball for them, however. He grew up in Detroit thinking he was going to be a baseball hero and didn’t even begin to play organized basketball until the 11th grade. “My first year was a total wipeout,” says Roundfield. “We lost every single game. I was the shortest center in our division, and we got killed every time.” By his senior year at Chadsey High School, Roundfield’s game was improving, but he was often overshadowed by a couple of other future stars from the Detroit area—Campy Russell and James McElroy, both now in the NBA with Cleveland and Atlanta respectively. Only six or seven colleges bothered to recruit Roundfield, but he chose none of them, electing instead to go to Central Michigan after his parents urged him to apply for a basketball scholarship. Had his parents been less persuasive, Roundfield would probably be a bank teller today. Come to think of it, he is a bank teller today, working at the Fulton Federal Savings & Loan in Atlanta during the off-season. In 1980 Roundfield made first team all-NBA. In 82-83, Roundfield put up 19 PPG and 11RPG. Roundfield was also a three-time member of the first team all-defensive team. Roundfield finished out his career in Detroit and Washington. His career numbers over 12 years in the ABA and NBA: 14 points per game and 6 rebounds per game. When you talk old school players, Roundfield would be the guy you would want your players today to emulate. While doing some research on Roundfield I came across this funny exchange between an NBA official and Roundfield’s coach Mike Fratello compliments of Sports Illustrated. Thoughts and prayers go out to the Roundfield family. I was 12 years-old when I stepped inside Madison Square Garden for the very first time. The year was 1976, it was Christmas night and the Philadelphia 76ers were in town to face my New York Knicks. Mom had a friend named Jerry who worked at the Garden; it was Mom’s gift to us. My brother and I, who was four years older sat in the “red seats” just inches from the court; we were right behind the Knicks bench. The 76ers were a very good team. They had George McGinnis, Doug Collins and World B. Free in their line-up but their biggest star was the Doctor, Julius Erving. I felt good that night because the Knicks had Walt Frazier, Earl Monroe, Spencer Haywood, Lonnie Shelton and Bob McAdoo. It was only just a few months before that game I travelled from Brooklyn to Manhattan all alone to see Doc at Power Memorial High School. Erving was a guest speaker at a clinic sponsored by Converse. Only I don’t recall him speaking, just dunking. All I remember is Doc running really fast down the court and taking off from the foul-line, throwing down a vicious slam and walking out of the gym. I was in the crowded gym that morning but by myself. No parent, no coach and no older brother. To this day I can’t believe I hopped on the New York Subway at 9 a.m. and made my way to the gym where Kareem Abdul-Jabber played his high school basketball. But it was the Doc, one of the best players in basketball. We had watched Erving on TV many times but I never had seen him in person while a member of the Nets. They played their home games out on Long Island at the Nassau Coliseum. We didn’t have a car nor could we afford tickets. There were kids in my schoolyard that thought they were the Doctor. One kid, Jimmy Corrar even wore number 32 for our school team. Corrar tried to duplicate Julie’s moves, wasn’t even close. In the book, ‘Doc’ written by Vincent M. Mallozzi, there is a copy of a scouting report filed by Howard Garfinkle of the famous 5-Star Basketball Camp. “Garf” used to rate and publish a report that he distributed to colleges around the country. Here is what Garf said about the Doc when he was in high school at Roosevelt. Garf also gave Erving a “10” in the attitude department. During his senior year in high school Erving had a decision to make on where he wanted to attend college; it came down to St. John’s University and UMass. Doc signed with UMass and it must be noted that his high school coach, Ray Wilson followed him; he was hired as an assistant coach. At UMass Doc played two seasons on the varsity team. In his first season playing on varsity (his sophomore year) he scored 25 PPG and pulled down 20 RPG. This was a time when freshmen were ineligible to play varsity. In his junior year he scored 32 PPG and grabbed 20 RPG. Doc declared hardship. But in the days of short shorts and no cable television, you had to wait for your class to graduate before you were eligible for the NBA draft. There was no rule to playing in the ABA though. Doc signed with the Virginia Squires. “We had heard about Julius Erving and asked for a tape of him. We got this grainy back-and-white film of the UMass-North Carolina game in the NIT. The quality was so bad that you could hardly tell what was going on, but we saw enough of Julius to sign him after his junior year. Since we;d never seen him live before he wore a Squires uniform, we thought he’d be able to help us on the boards and we’d hope he be able to score some. We had no idea what he’d become,” said Johnny “Red” Kerr who helped the Squires sign Doc. All he did was average 27 PPG as a rookie. During his rookie season in Virginia Doc’s teammates were Charlie Scott (Virginia’s’ leading scorer 34 PPG) and Doug Moe. The following year the Milwaukee Bucks drafted Erving 12th in the 1972 draft. To refresh your memory, that was the draft where the Portland Trailblazers selected LaRue Martin with the first overall pick in the draft. It was also the draft that saw Russ Lee and Tom Riker go ahead of Doc. Now here’s my thing; in his rookie season he scored 27 PPG, NBA GM’s didn’t see that? Instead of signing with the Bucks, who had Oscar Robertson, Bobby Dandridge and Kareem Abdul-Jabber on their roster, Erving signed instead with the Atlanta Hawks. Could you imagine what that Bucks team would have been like with Doc? The year before the draft they went 63-19. “Julius is just too good,” said Red Auerbach. Erving managed to play a couple of exhibition games with Pete Maravich. The league stepped in and said he couldn’t play anymore so it was back to the ABA. Basketball writer and one of the best historians of the game David Friedman writes about the two playing together on his blog, 20 Second Time-out. Erving was named MVP of the finals. 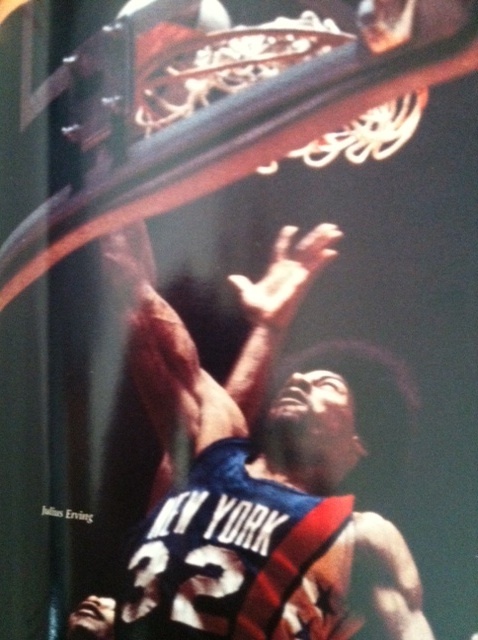 Doc was named ABA regular season MVP three times and was voted All-ABA First Team four years. “I can’t give you the three best players of all-time in the ABA but I can give you my two favorites; Connie (Hawkins) and Julius Erving,” said Mark Cuban. In 1976 the NBA and ABA merged. The Nets acquired Nate ‘The Skate’ Archibald from Kansas City in exchange for Brian Taylor and Jim Eakins. The Doc and Nate the Skate together on the same team? Nets fans were looking forward to taking on the teams of the NBA. But it never worked out. Money was a huge problem with Nets owner Roy Boe. The Nets had to pay the NBA to enter the league and they also had to pay the New York Knicks to be in the same area. The Nets sold Doc to the 76ers in October for $3 million. The best player from the ABA went on to play 11 seasons in the city of Brotherly Love. The Nets fell apart; with Erving gone, and Archibald playing only 34 games because of an injury they went from ABA champions to 22-60. During his first season in Philadelphia Doc led the Sixers to the finals only to fall to the Portland Trailblazers, 4-2. Over the first six years in Philly, Doc’s team fell three times in the finals. Finally, in 1983 he won his NBA ring by sweeping the Lakers. He was named All-NBA First Team five times. “Julius was a fierce competitor like all great players. People might not have noticed that on a regular basis because of the way he conducted himself,” said Billy Cunningham, Doc’s coach in Philadelphia. As a young boy on that Christmas night 36 years ago watching Erving and his teammates beat the Knicks 105-104 left an impression on me; despite only scoring 16 points I watched Doc make two big baskets down the stretch to kill any chance the Knicks had of winning. It was World B. Free, the Brooklyn native who led Philly in scoring that night with 30 but it was the Doc who I thought about while sitting on the train on my way home.